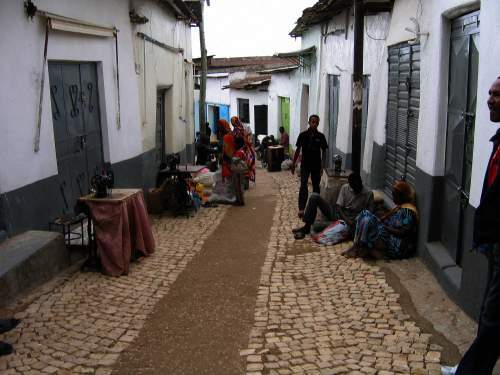 Harar Jugol, is old-town Harar within the embattlemented wall. 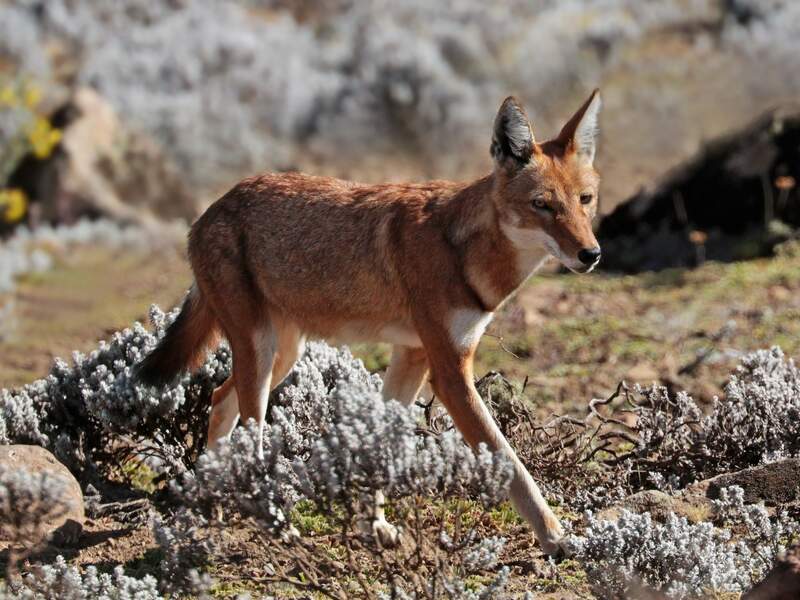 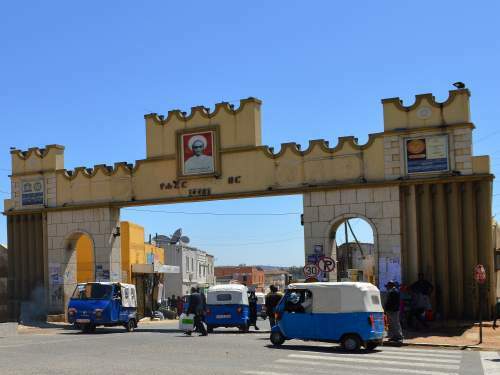 With a population of about 150,000, Harar is located on a hilltop at an elevation of 1,885masl in the eastern extension of the Ethiopian Highlands, at a road distance of � 525km east of Addis Ababa and a road distance of � 50 km south-east of Dire Daweat. Called Gey "the City" by its inhabitants, Harar was founded between the 7th and the 11th century and emerged as the center of Islamic culture and religion in the Horn of Africa. 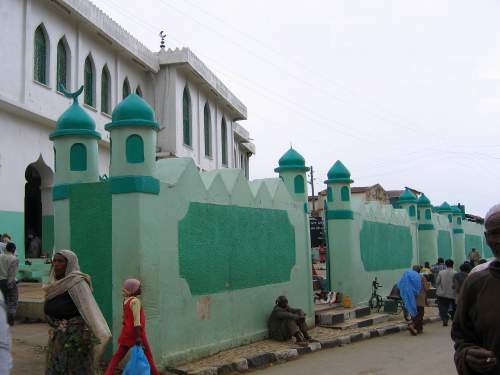 Harar Jugol is a walled Muslim city with 368 narrow alleyways, said to be the fourth holiest city of Islam, with 82 mosques and 102 shrines dating back to the 10th century. The � 3,5km almost 4m high fortified city wall was completed in the 16th century after the conquest of the Christian highlands, and it served as capital of the Harari Kingdom from 1520 to 1568, becoming an independent emirate in the 17th century. 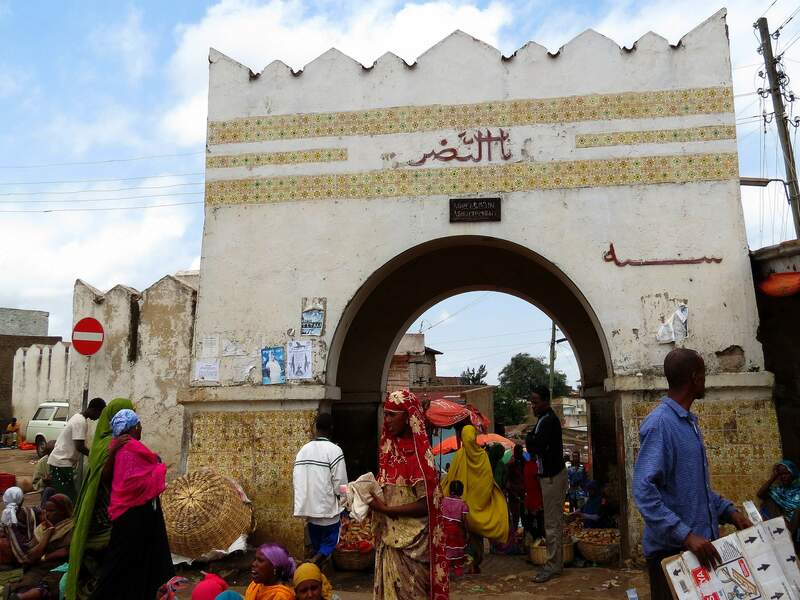 The old walled city, Harar Jugol with 5 gates, was declared a UNESCO World Heritage site in recognition of its cultural and architectonic heritage. 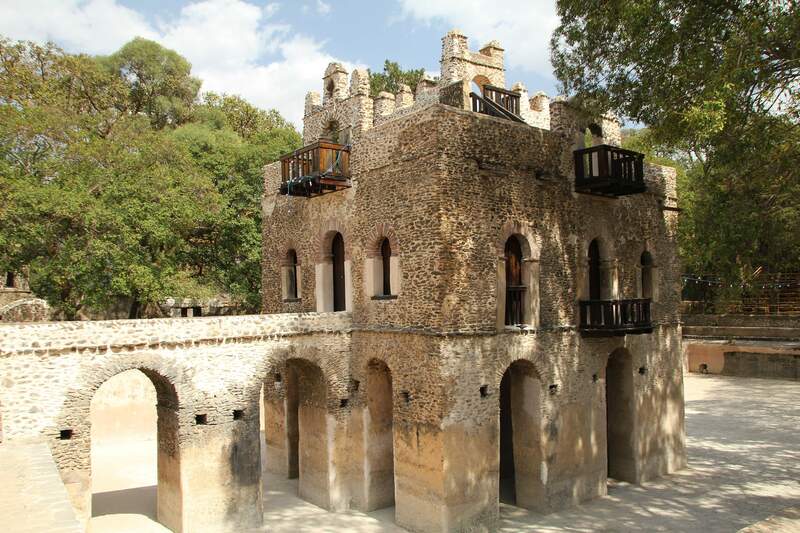 It is sometimes known in Arabic as "the City of Saints" "Madinat al-Awilya". 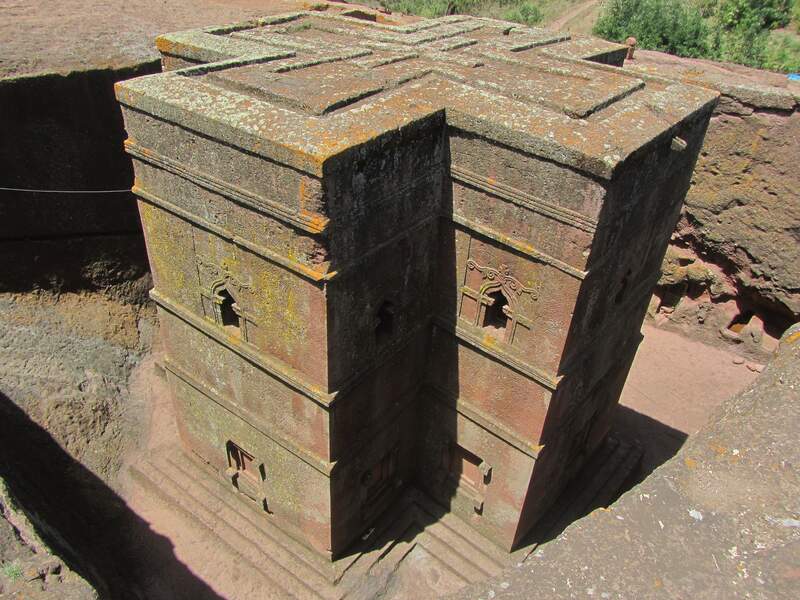 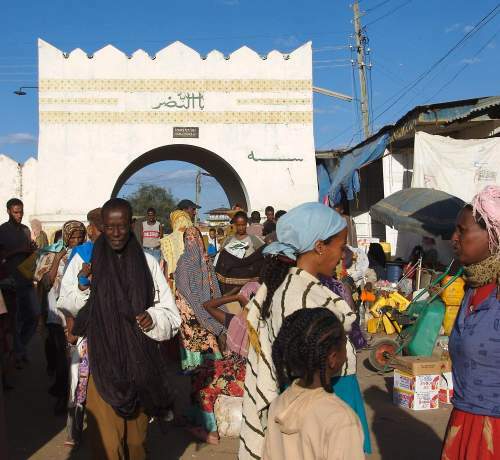 The 16th century was Harar's Golden Age. The local culture flourished, and many poets lived and wrote there. 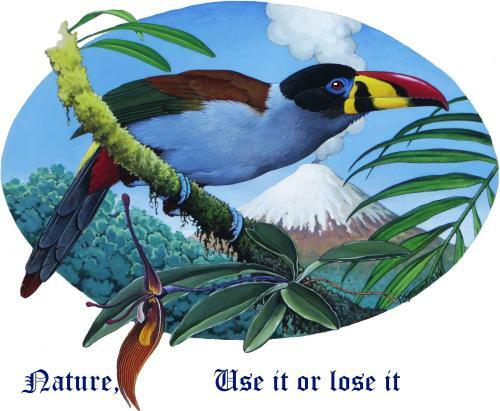 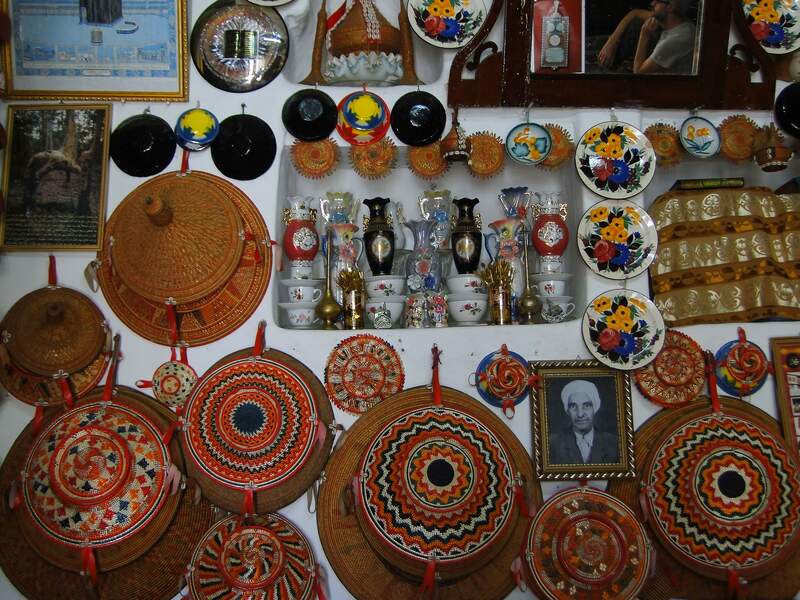 It also became known for coffee, weaving, basketry and bookbinding. 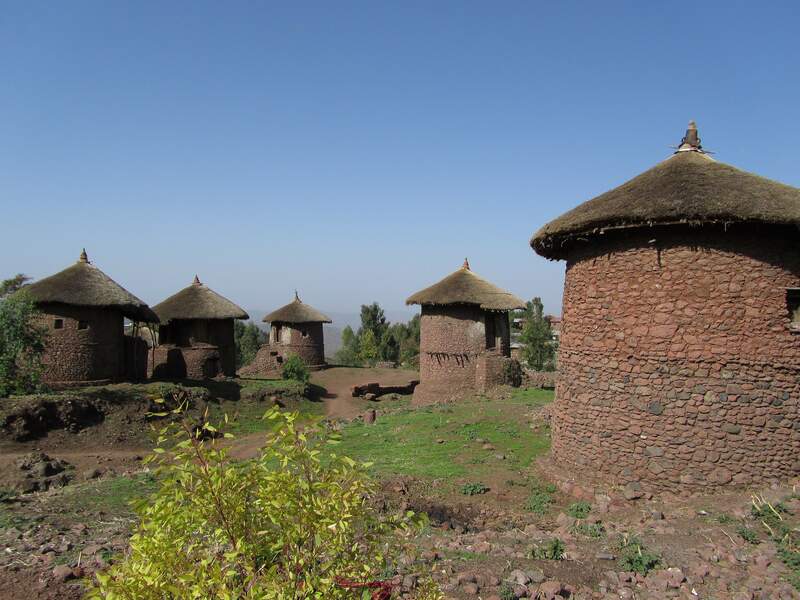 A war of conquest expanded the territory and threatened the existence of Christian Ethiopian Empire. 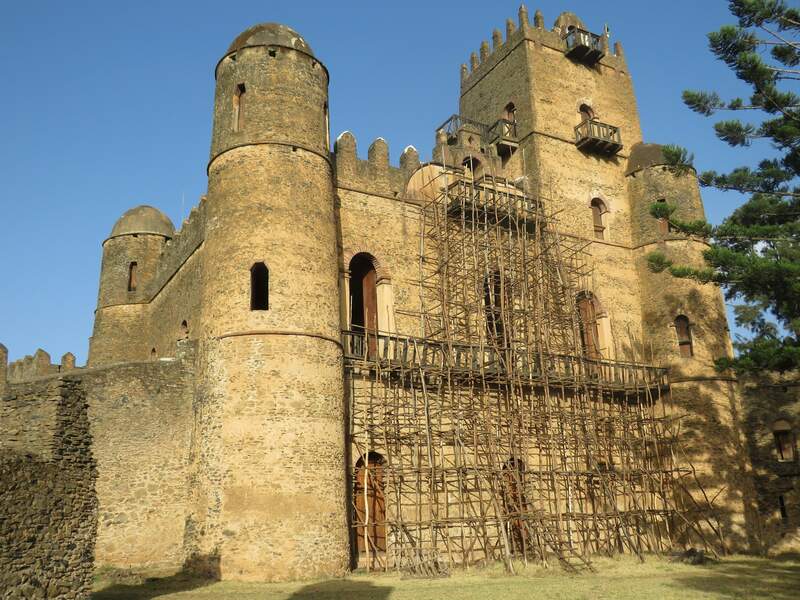 Emir Nur ibn Mujahid, built the embattlemented 4 m high curtain wall, called Jugol, around the city with five gates. 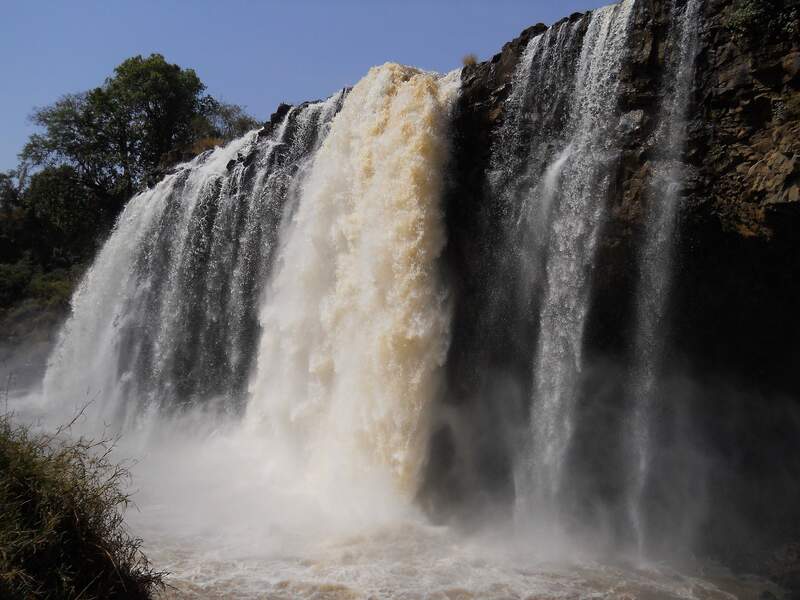 Arthur Rimbaud, a famous French poet lived in the city as the representative of commercial companies trading in coffee, musk and skins. 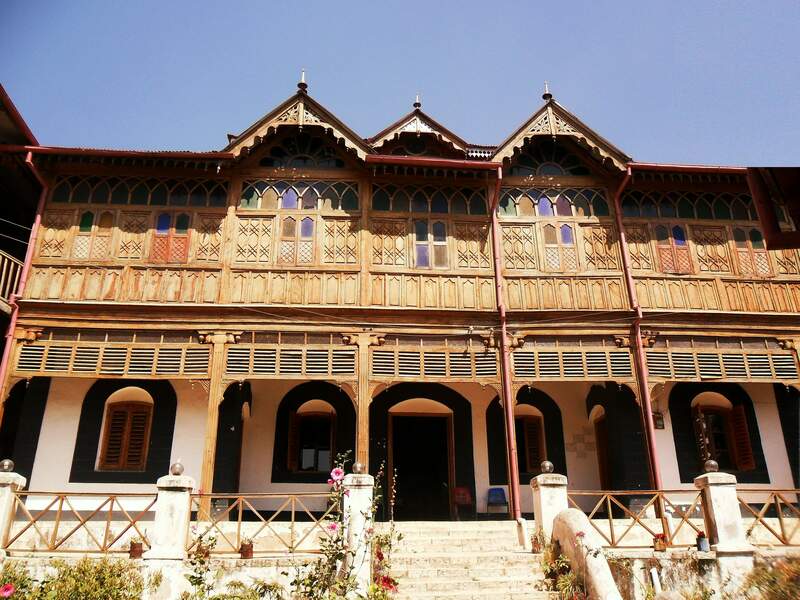 The Rimbaud House is now a museum. 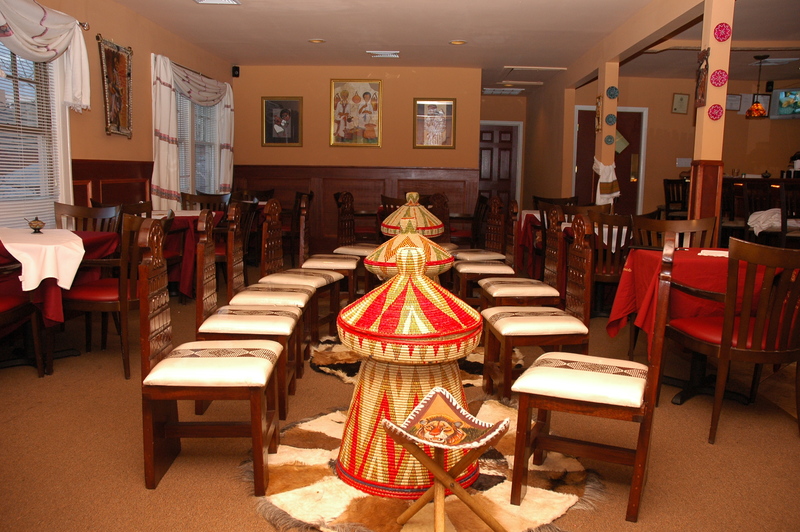 The Harar Brewery's beer can be sampled at its social club adjacent to the brewery. 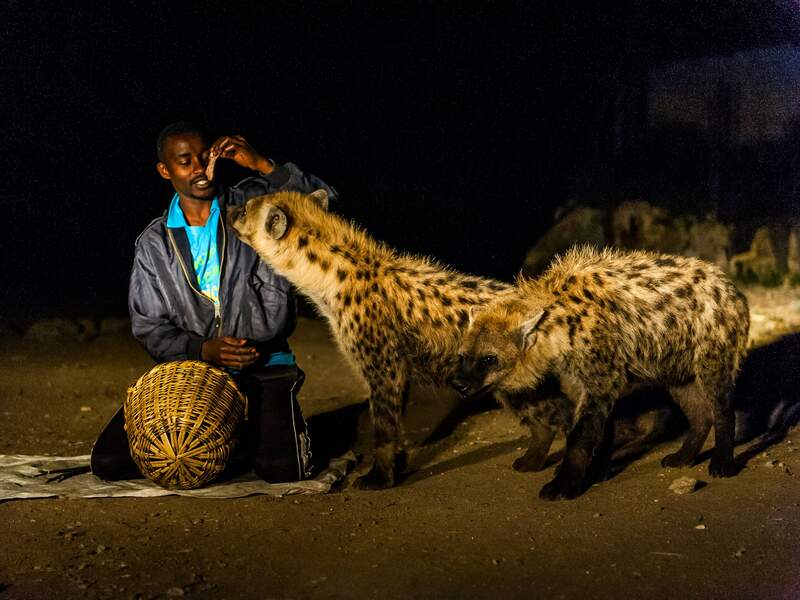 An old tradition involves the feeding spotted hyenas, which can bee watched by tourists after dawn. The people of Harar claim that the domesticated coffee plant came from Harar, but the precise origin remains rather mystic. 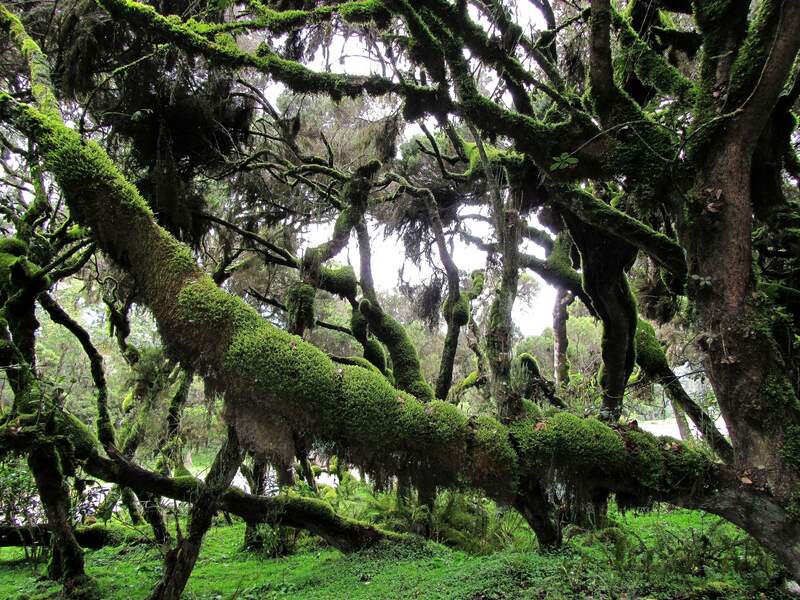 The word itself seems to refer to the Kaffa Region, where it still grows in the wild. 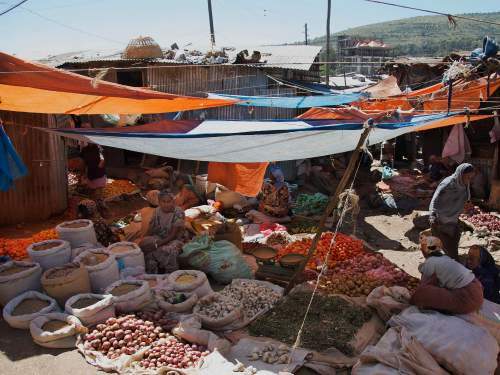 The Harar region also may be the place where the khat plant became in use as a mind stimulant. 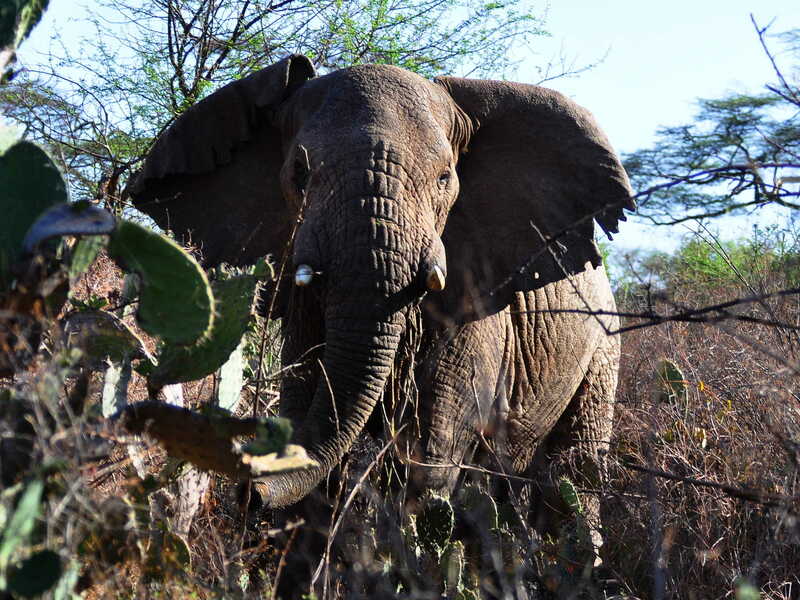 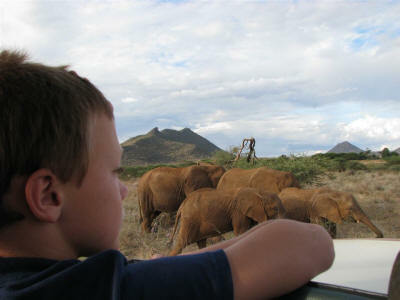 At about 25km from the city is the Babile Elephant Sanctuary, the best park in Ethiopia to see Elephants. 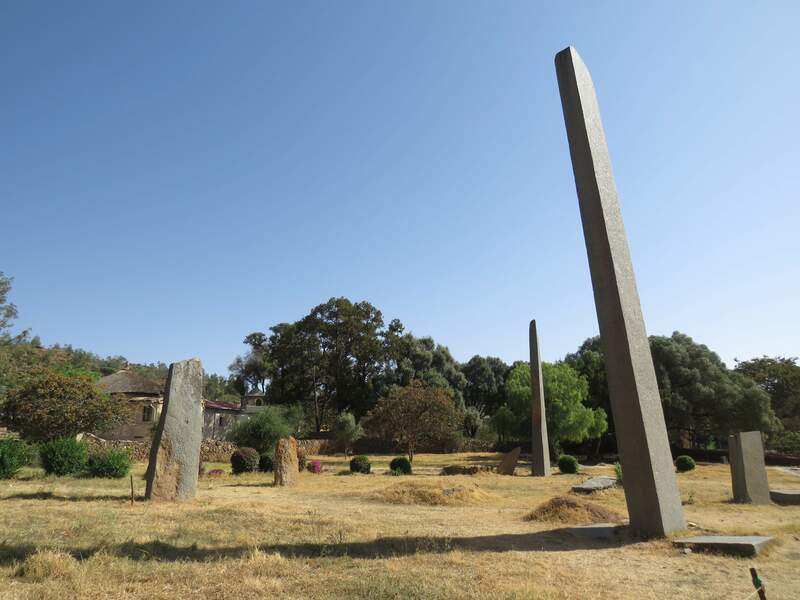 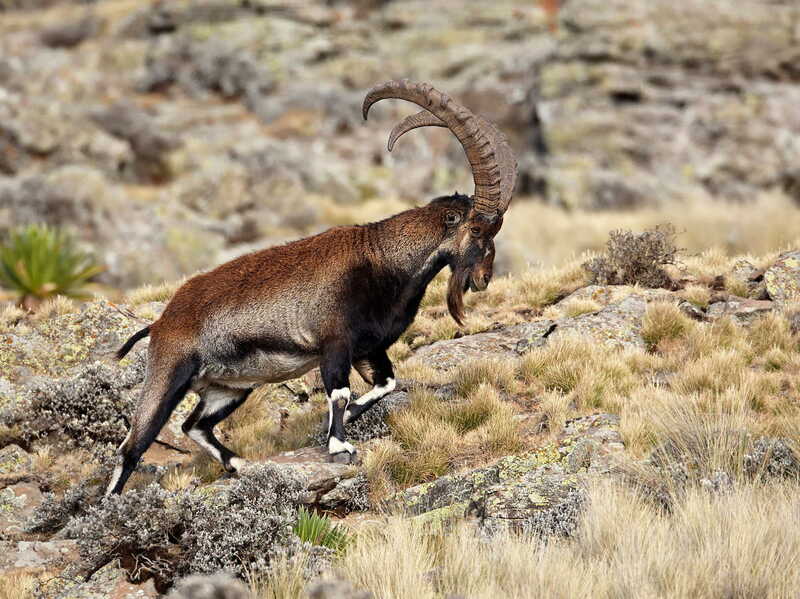 Other nearby attractions include the Prison House of Lij Eyasu in the Gara Mulleta Mountains. 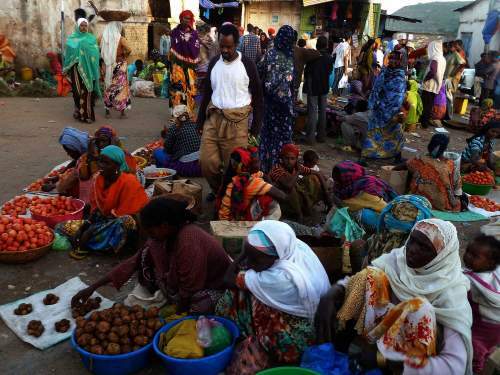 Left: Market at Gate of Harar. Above: Main gate of Harar Jugol, Ethiopia. 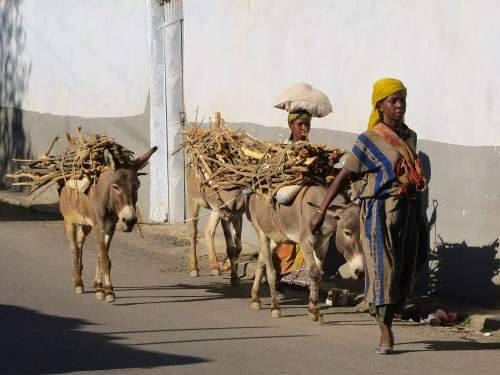 Continuous supply of firewood from the hills are brought into the city, exhausting the surrounding forests. 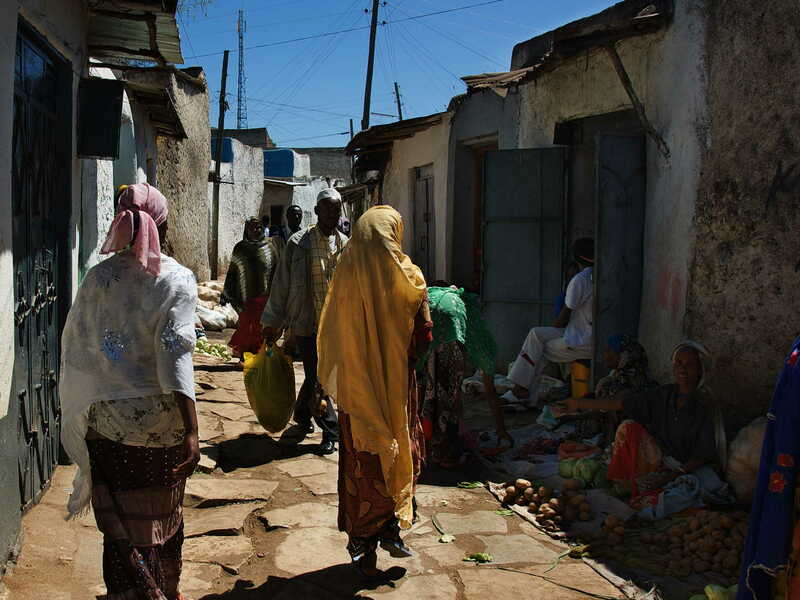 Street scene in a narrow street in Harar, Ethiopia. Mekina Girgir, or Machine Road, is a cobbled street in Harar where tailors work on their sewing machines. 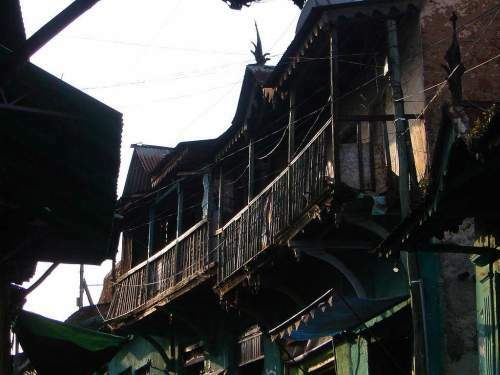 Famous historical Harar houses with balconies. 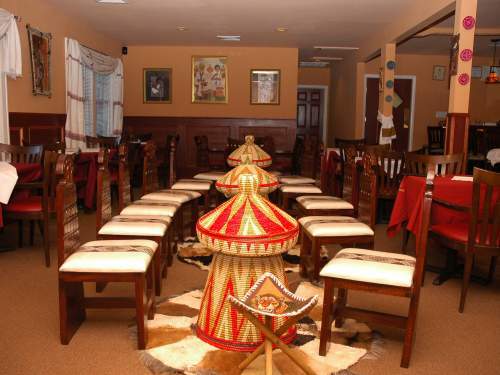 The Mesob restaurant in Harar, Ethiopia, is one of the more pleasant restaurants attending to tourists. 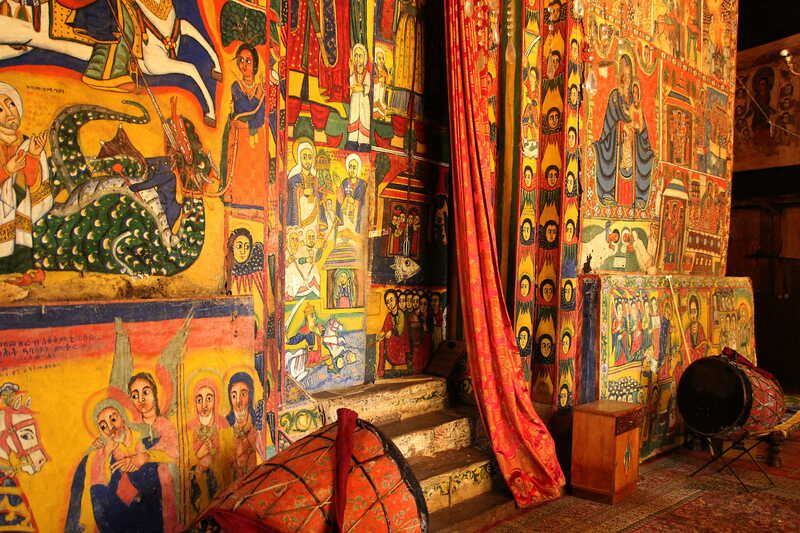 The living rooms of traditional houses in Harar are centered around an elevated pillowed sitting area with an oriental rug. 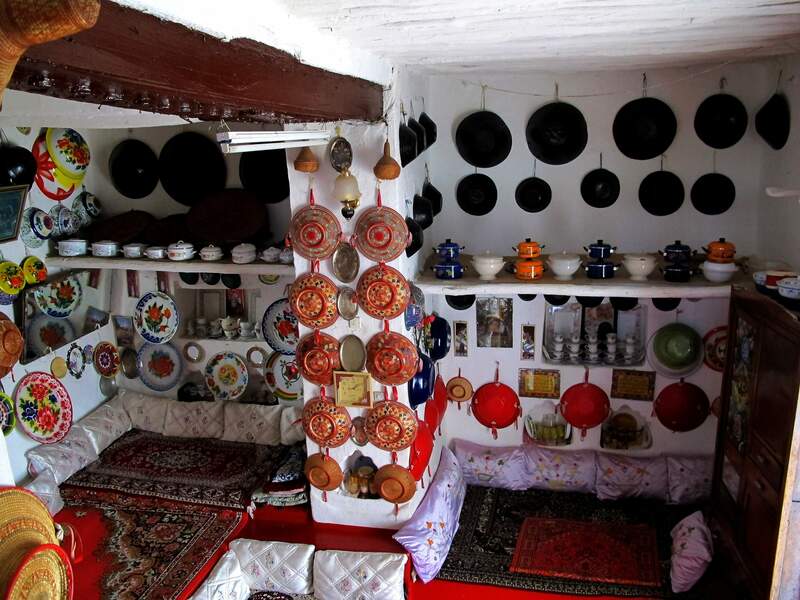 The walls of the living rooms are richly decorated with baskets, pans and vases. 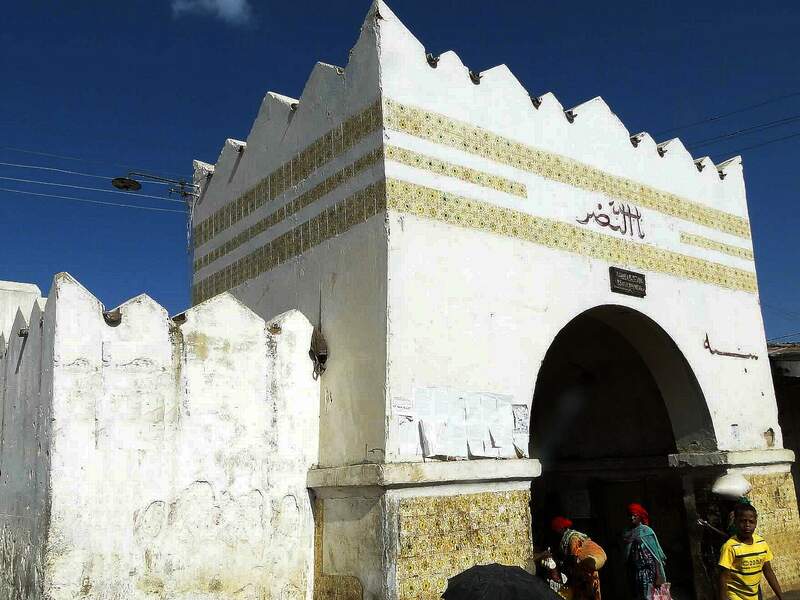 The Al Jami Mosque, of Harar, supposedly dating back to the middleages, is interesting, but judging from its style it is more likely it was built last century. 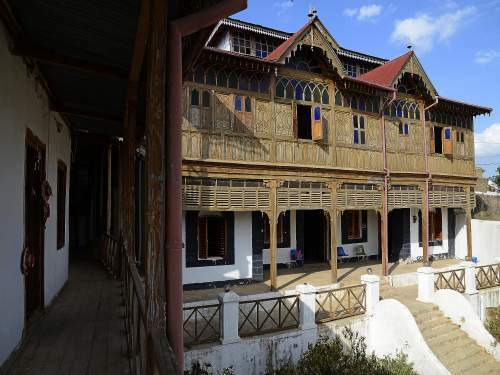 Jean Nicolas Arthur Rimbaud, influencial French poet lived in the Rimbaud House in Harar, Ethiopia, while working for the Bardey Company. 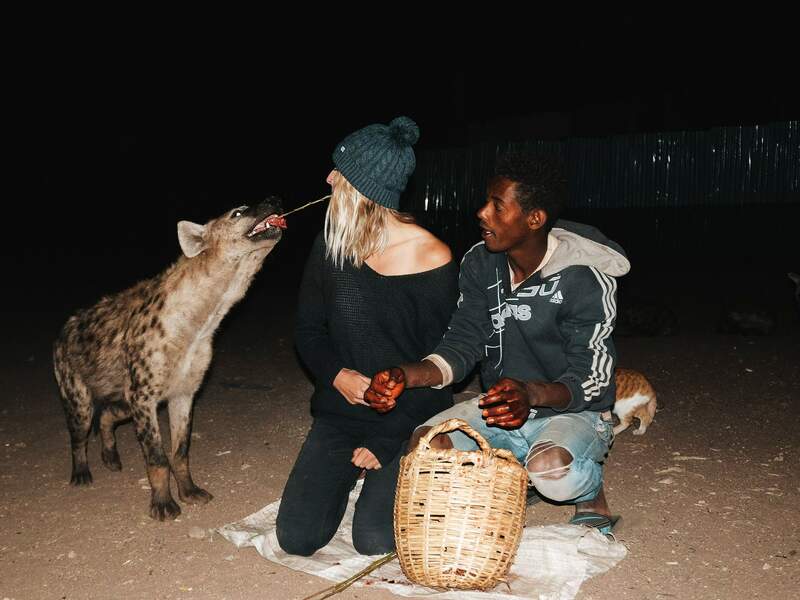 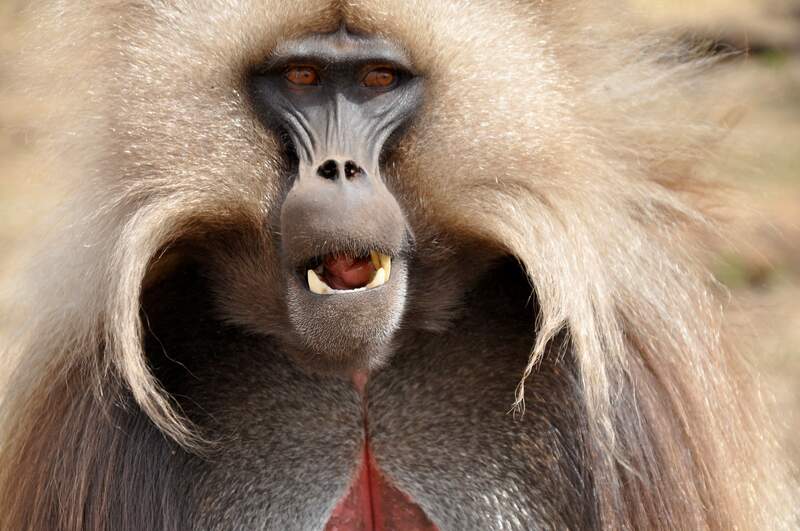 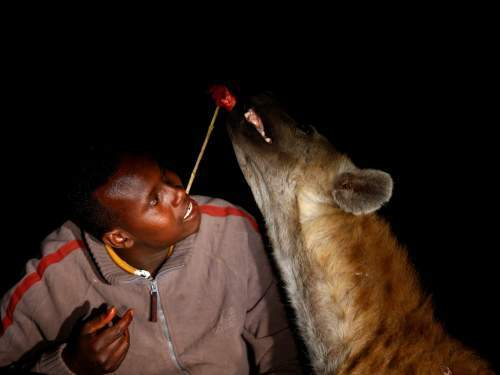 Harar Hyena man invites lady tourist from the public for hyena feeding in Harar, Ethiopia. Harar Hyena man showing his wild urban spotted hyenas to tourists. 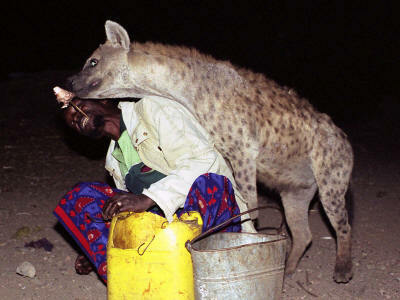 Like in so many other cities in Ethiopia, hyenas live within the cities, like stray dogs living off garbage and snatching domestic animals.